Dinner at Christina's: Project Food Blog - Hot Tamales! Newburgh, New York has always been a special place for my family. It is where my mom went to college, where my parents were married, where I was born, very near where my brother went to the Culinary Institute of America, where some relatives still reside, and where other relatives, including my Grammy, are laid to rest. There is this tiny, little box of a Mexican restaurant in Newburgh where every Thursday is tamale day. You have to let them know in advance how many you will be ordering and when they're sold out, that's it. You have to wait until the next Thursday for another chance! Perhaps this introduction to tamales fueled my belief that they are special. I knew them as something that was coveted, that were a lot of work, and definitely worth it in the end. If I see tamales on the menu at an authentic Mexican restaurant, you better put money on the fact that I'm going to order at least one to try. There is something so poignant to me when I see this dish on a menu, moreso than any other dish. I know that the recipe is most likely a very old one, taught to the maker by their mom or grandma. I also know that it is a recipe of love, with so much time and hands-on work put into it. How can I help but want to try it? Up until this point, I had never made my own tamales. It never even occurred to me, until I learned that my dad had been mastering the skill and I got to watch him this summer. Isn't it funny how watching somebody else do something makes it less scary and intimidating? I visited a cramped Mexican grocery in a strip mall and purchased dried corn husks, masa, and lard. Then, I turned to the king of Mexican cooking, Rick Bayless, for recipe inspiration. I've never been one to follow recipes to a T, so I read through a variety of Rick's dough and filling recipes until I decided what I wanted to do with mine. I set aside my own tamale day, since I knew I'd be in the kitchen for hours on end. Johnny was warned, I mentally prepared myself, and looked forward to it on the calendar with great anticipation and slight anxiety. First, I started the filling, which consisted of the meat and sauce. I knew it had to simmer for a long time, so I wanted to get it set up and cooking so I could concentrate on other things. 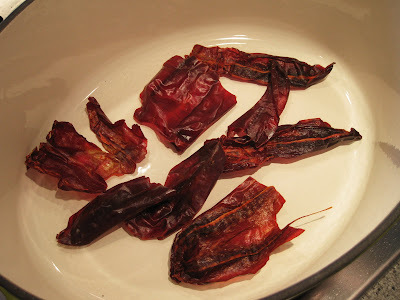 Begin by breaking the dried chiles open and removing the seeds and membrane. Then rip the chiles into large pieces and toast in the bottom of a dry, heavy-bottomed pan over high heat (I used my dutch oven). Press down with a metal spatula until the chile's skin begins to blister and darkens. It will start to smell like popcorn with a bit of a chile kick. Once the chiles are toasted, move them to a small bowl and cover with hot water. Place a small plate over the chiles to keep them submerged. In a large pot (I continued to use my dutch oven), bring 8-10 cups of water to a boil. Meanwhile, cut the pork into 1" cubes. Add the salt and the pork to the water. For the first few minutes, use a large spoon to skim off any foam. Lower the heat to medium, partially cover the pot, and let the meat cook for 40 minutes, until it is really tender. 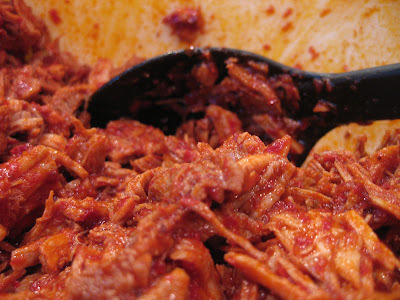 Remove the meat to a large bowl with a slotted spoon, reserving the cooking liquid in another bowl. Drain the chiles and put them in your food processor along with the garlic, cumin, pepper, and raisins. Add 2 cups of the reserved cooking liquid and blend until smooth. In the same large pot, over high heat, melt the lard. Transfer the chile mixture to the pot and add an additional 1 cup of reserved liquid. Stir to incorporate, and let the sauce sear and thicken for about 5 minutes, covering with a mesh splatter lid. 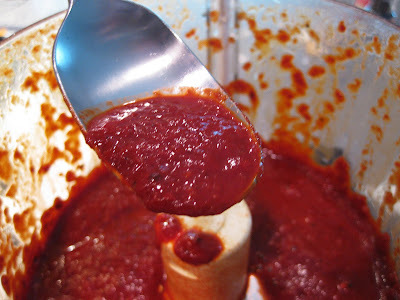 Lower the heat and let the sauce continue to reduce for another 15 minutes. While the sauce is thickening, shred the pork with your hands. Once done, add the sauce and stir. Set the filling aside until you're ready to make the tamales. Clean out your kitchen sink and fill it with very hot water. Separate the dried corn husks and drop them into the water. Place a large plate or dish on top to keep them submerged. These will soak while we move onto the dough. The above amounts are quadrupled. I made four smaller batches in the food processor, then transferred to a large bowl. Begin by cutting the kernals off the corn. Then with the back of the knife or a spoon, scrape the ears to get the remainder of the kernals and sweet juice. 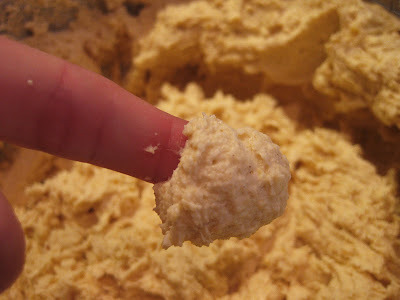 Add to the food processor bowl and process until it's pureed. Add the remaining ingredients and run until it is a thick dough. Once the four batches were in the large bowl, I used a hand mixture and slowly incorporated the remainder of the reserved cooking liquid (about 3-4 cups). The consistency will be like a thick cake batter. Now you are finally ready to start filling! Clear a large area on the counter or a table. Place the bowl of your dough, the bowl of your filling, and a steamer basket within reach. 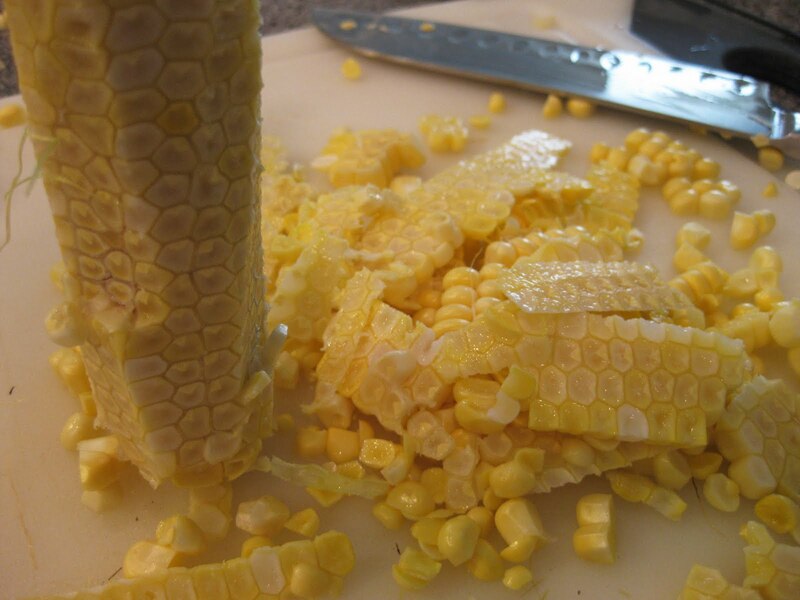 Grab a pile of the corn husks and wrap them in a kitchen towel, which you will also need within reach. First, take a husk and pat it dry. With the thin side facing you, spoon about 3 Tbsp of the dough onto the husk. Smooth out until the masa is about 4" x 2". Next, spoon about 1 Tbsp of the filling down the center of the dough. Now, grab both sides of the husk and bring up and inwards so the masa touches and "seals" in the filling. Continue rolling the excess husk into a tight packet, then bring the thin end upwards into a fold. 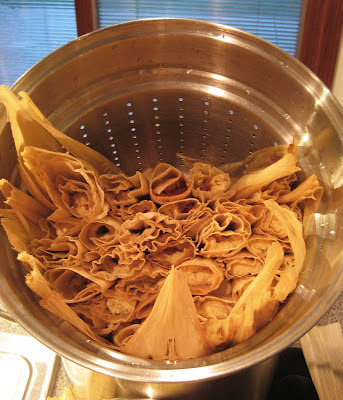 Place seam side down into a husk-lined steamer basket. Repeat, repeat, repeat - until your steamer basket is full. Place over boiling water, cover, and steam for 1 hour. Remove from heat and allow to cool for 5-10 minutes for the dough to firm up a bit. Two batches of baskets were steamed, resulting in a total of 71 tamales and 7 hours in the kitchen. That question was answered in the first bite. The excess tamales were wrapped individually in wax paper and placed in zip bags destined for the freezer. They will keep for several months and can be reheated quickly and conveniently for a quick snack, or a tasty dinner in no time! I WISH you could email a dozen over to me! 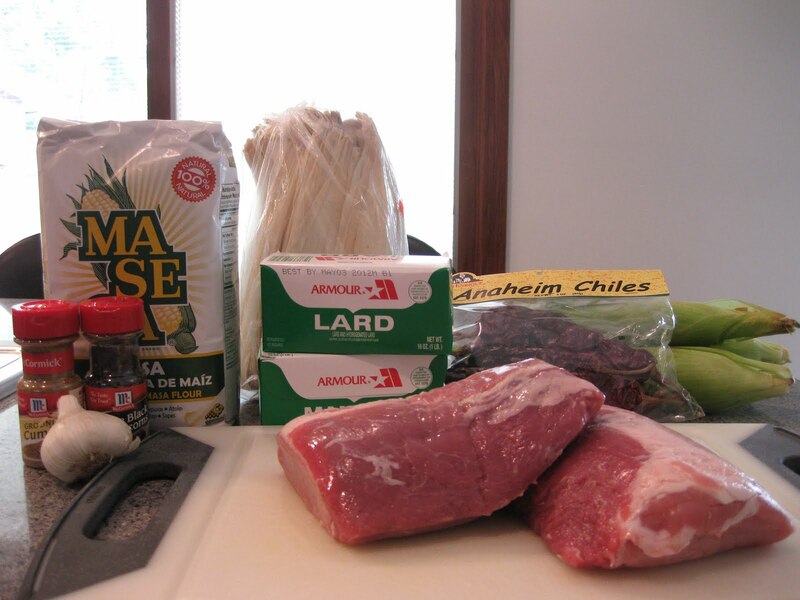 Gosh, I LOVE that you actually used REAL lard. How freaking amazing are you? When can we start voting?!! WOW what an ambitious and tasty-looking endeavor. Woot woot! WOW! Nice work!!!! I'm so impressed! isn't is great knowing YOU can make those now?! Those look absolutely delicious! 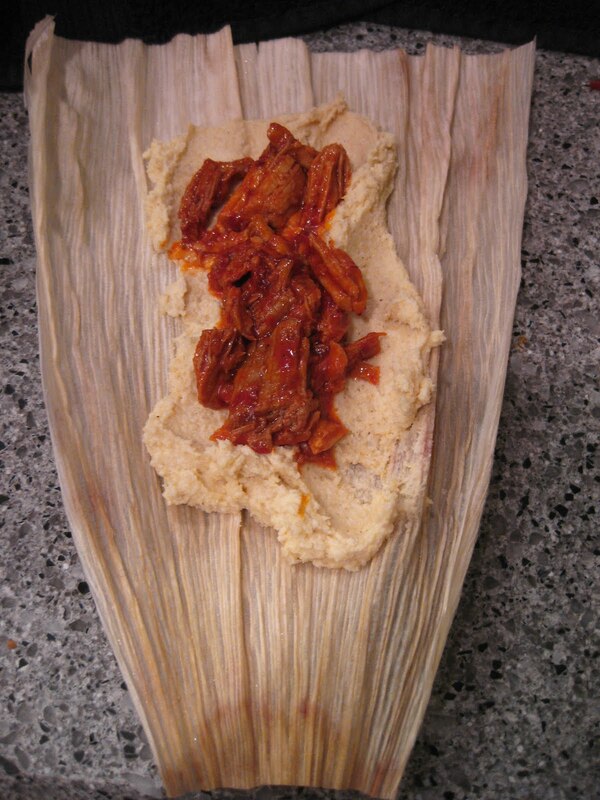 You did a wonderful job :-) I have always wanted to attempt tamales..maybe now I will! I grew up in Putnam County - down the river! (Now I live in Pennsylvania). I've only been to Newburgh a few times, but it's a lot of fun! Our family friend once had a party on a 'riverboat' that left from the docks at Newburgh. The restaurants down by the water are a lot of fun too! I can't believe you made homemade tamales! I've always wanted to do this!! 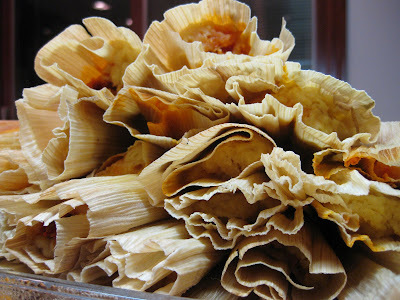 I love tamales - these look mighty good - great entry! Excellent work! That's a lot of tamales! I'm on my way over for one! These are on our list of things to make one day. A day when we have a lot of time and extra hands to help! They are just the thing that people appreciate; you can taste the love that goes into each one. Perfect thing to choose for PFB round 2! G'luck! Wow Christina! You totally went above and beyond. 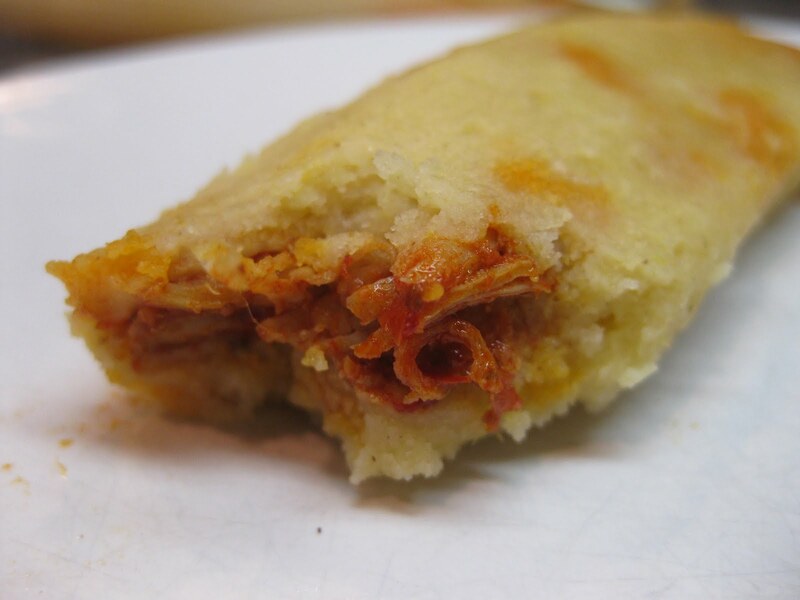 When I studied abroad in Mexico, my host family LOVED tamales. They visited this stand/home (?) in the neighborhood that made homemade tamales of all sorts of flavors. I was hooked after my first one! You've got my vote for sure. 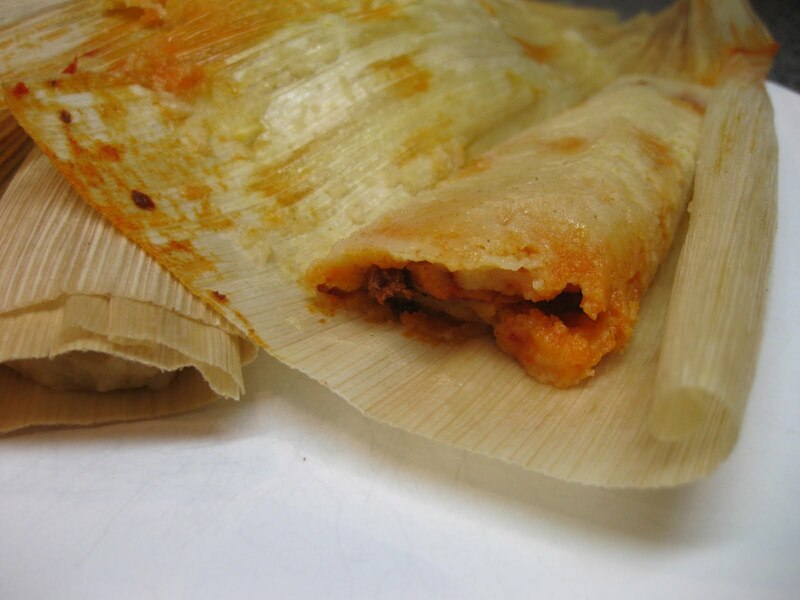 fabulous tamales you got there :) nice choice of a classic for round 2. congrats and i hope we all make it to round 3. best of luck! Impressive! 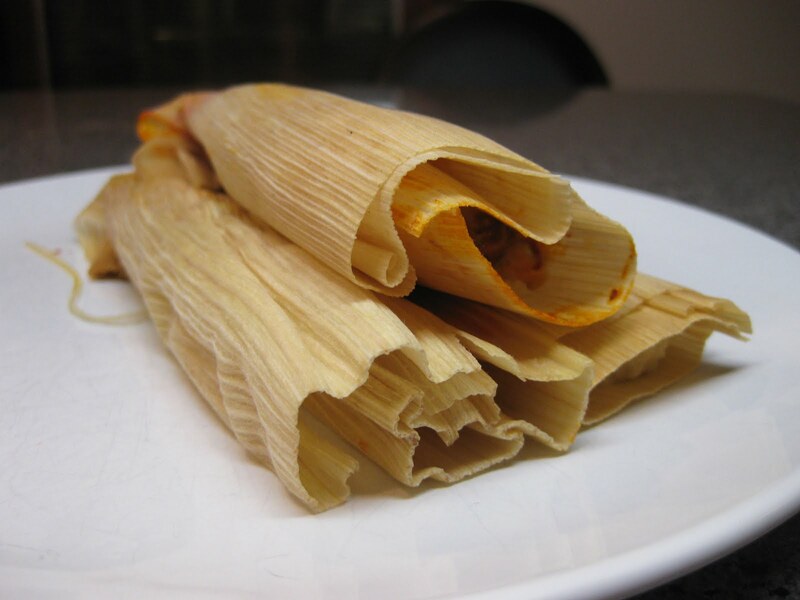 Tamales are so time intensive I usually wait for a relative to make them for some holiday or occasionally find a restaurant or store that sells homemade tamales. There's nothing like them! I voted. Hope you win!!! Great job! I had a tamale party last year and made them for the first time. I didn't attempt to make the masa from actual corn kernels though! Wow...these look scrumptious. I love tamales! I made tamales for my round two post as well. Too bad I'm not in round two!! I learned a lot in the process and really enjoyed the challenge. I know first hand how time consuming when making tamales. Even my traditional Mexican friends buy them instead of making them. Kuddos to you girl for tackling this dish. It looks yummy...and I'm getting hungry right now too. I voted for you. I admire your effort and making a dish that's difficult to make.